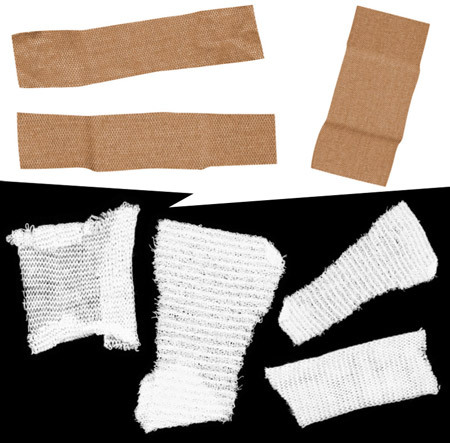 For my first set of free Photoshop Brushes here at SpoonGraphics we have a ‘First Aid’ inspired collection featuring bandages, plasters and band-aids. As discussed previously, I’ve recently started using Photoshop Brushes more in my design work, so I thought I’d have a go at releasing a collection of free brushes for reader to download. Very nice work. I will definatly ad to my collection. Brushes offer very good contrast. Thanks Bill, glad you like them! Back on topic…I’m a bit of a photoshop fanatic, so I’ll definately find a way to incorporate these somewhere. Love the brushes and I LOVE the design for your site, nice work! These are awesome! Thanks a ton.